It seems the the link ups are getting better and better every week. Thank you so much to those of you that are dedicated to linking up to our party each week. We hope you will continue to do so and to spread the word to your other blogging friends. I can't tell you how many of these ideas that I use or modify... I love coming here each week/day and looking through what has been shared! Thank you so much. 1. Hani over at Craftionary shared with us some awesome ideas for Father's Day... and not only are they awesome-- there are free printables. Who doesn't love FREE? I know that I do. Running a daycare can get quite expensive so I love seeing free items that are linked up. I especially love the mustache coffee cup .. I think that is going to be a definite to-do for our Father's during daycare. I also love the letter/poem using candy. I recently saw that on pinterest and I pinned it to use for sure. 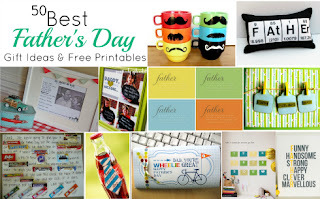 Thanks Hani for linking up awesome ideas for Father's Day... you always link up such fun things! 2. 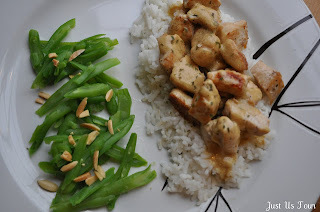 Shannah over at Just Us Four shared a very yummy looking recipe. It is funny because a few days ago I posted on Facebook asking friends for a quick, simple recipe with chicken. I wanted to do something I do not normally do... but something that was yummy. Take a look at her Step-by-Step directions to making Mustard Chicken. I wish I was eating at her house... right now. The green beans look fresh out of the garden. YUMMY! This recipe is going to be a must in my home this week! Thanks for sharing. 3. Now this is a beauty. You have to check out this redo over at J House Tawk. She took an old cabinet and turned it into a show cabinet. I especially love the fact that you can have the doors on it to hide the shoes. 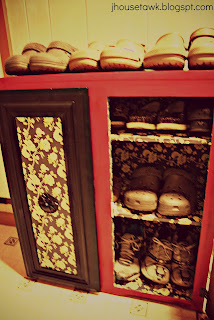 Shoes, shoes, shoes... who doesn't have too many shoes... and that end up in places they do not need to be? This was very creative, fun, and I love the colors. Thank you for sharing with us. Thanks so much to everyone that linked up! And remember as part of being featured, we will be pinning these great posts to our Pinterest boards, check it out!